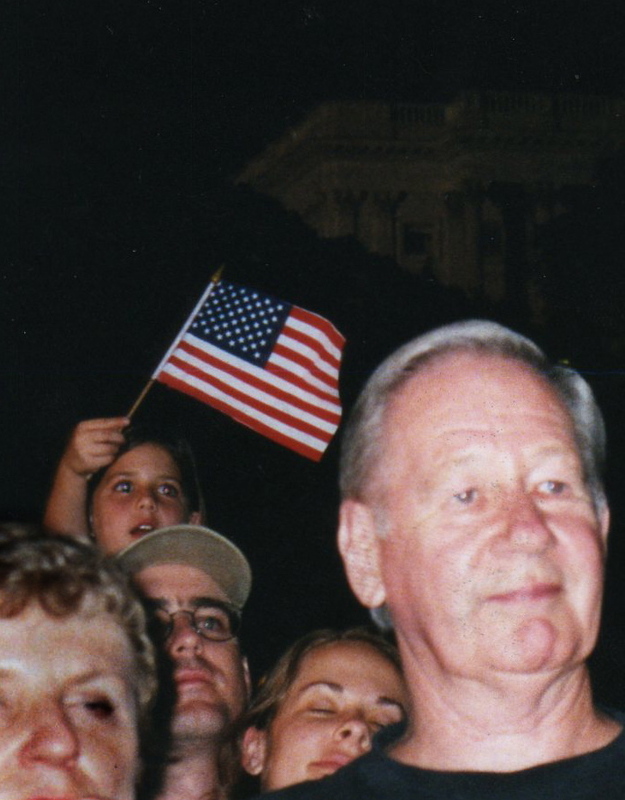 After breakfast on the morning of the 4th of July, 1998, my buddy and I wandered over to the Capitol to survey the area and find the optimal place to view both the fireworks and the show. Unbelievably, people had already laid down a few dozen quilts to mark off their saved spots. Who were these people that had nothing better to do with their lives than sit out on a lawn in muggy heat for eight hours? Surely, whatever they were waiting for was worth it if they were this committed. We stepped over a knee-high wall and explored the terrain searching for any prime land that remained unsettled. Though the best spots had been claimed, a few good areas remained. If we’d waited any longer we might have lost out on a chance for a spot, so we hurried back to our apartment a few blocks east of the Capitol to grab necessary supplies. Carrying just the essentials—a quilt, camera, tape recorder, Dostoyevski’s Crime and Punishment to help pass the time, and a cooler of beer—we headed west across a sea of grass to join the sweaty, huddled masses. A furious land grab was inevitable. The lawn in front of the Capitol was already twice as full as before, and the short wall that we had hopped just an hour before to gain access to the lawn was now reinforced by a five-foot fence. A guarded narrow staircase leading over the wall provided the only access to the area. The crowds poured into the space and scattered to find spots to set up their temporary homesteads. Somehow we found a perfect section that offered a clear view of the concert stage and the Washington Monument. By five o’clock the lawn had become a patchwork quilt of patchwork quilts. Beside us, only a tiny strip of unconquered grass remained. I stretched my legs across this area trying hard to protect it. Then came the family of six. She was absolutely right but the dad insisted, “Oh, we’ll make it work.” He bullied a group in front of us, who had been there since nine in the morning, into surrendering some additional land for his family. I wanted to say something to halt their aggression, but I didn’t, and reluctantly watched as they made themselves comfortable at the expense of our own comfort. An hour later fifteen of their relatives trekked across the dense landscape to join in the land steal. It was physically impossible to fit any more people on that strip of land without invading our privacy. The adults gently spread their quilts over ours while maintaining friendly conversation with us, but their children trampled over our quilts with no regard for our claim. Eventually, we were crammed into four square feet of space. This was not fair, I thought. Why should I have to share my little parcel of the Mall? We had sacrificed our day, battled heat, humidity, thirst, hunger, and dehydration so we could have our own little view of the majestic firework display, and here they came, freeloaders, arriving at the 11th hour to steal our fruits without putting in the labor. They were probably proud of their opportunism, that they had played their cards perfectly and had nabbed a decent spot to enjoy the show while still being able to enjoy a little AC during the hottest part of the day. When you think about it, there’s not much difference between an opportunist and a freeloader except that we celebrate one and detest the other, the real difference depending only on perception. I decided not to make the distinction and allowed myself to feel happy for them. Complaining would only make two unhappy groups of people. I would find a way to enjoy the show, and if I could share this moment with a few others, so be it. By 6:30 the umbrellas that once shielded the sun were now blocking a light rain that fell. A lady settled on the narrow strip of grass behind us, careful not to intrude on our limited space. She was waiting for her husband to join her, but by seven, the patrol on the border was turning back new immigrants to the lawn. If someone from the lawn wanted to leave and return, they were required to obtain a password. The password was Cheeto. Eventually the rain waned and the concert began with a tap dance number starring Tony Danza and a pair of bright-eyed dancers. Actually, I felt kind of sorry for them. I’m sure they spent a lot of time preparing and synchronizing their steps, but in the age of Michael Flately and Riverdance, it just wasn’t too impressive. Then came the longest rendition of the National Anthem that I’ve ever heard. After Sha-Na-Na revived a couple of their tunes, Suzy Boggus approached the stage to sing Woody Guthrie’s socialist anthem. About this time I noticed that our quilt had become a home to a couple of unfamiliar kids. What the hell were they doing on our quilt? We sang along with the rest of the crowd as I wished I could sit on the cushy chairs in the roped off section in front of the stage, but this prime real estate was reserved for the politicians and VIPs. What we were all waiting for was the grand Russian overture, which signaled the climax of the American celebration. When the cannons fired and the trumpets blared, we would instinctively search the skies. We were treated to the whole 15-minute rendition filled with the unmistakably Russian folk themes. (Personally I don’t mind this rendition, because the build to the climax is that much more dramatic, but starting in 1999, the National Symphony Orchestra apparently decided that most people would rather not wait for the payout, and now play the last three minutes and the most exciting bit of Tchaikovsky’s tune.) Anyway, after the roaring cannons and blasting fireworks, the entire crowd joined in the singing of God Bless America. After all the fighting and jostling for position, everyone was now cheerfully singing. It was a chilling moment. As much as we got on each other’s nerves, we seemed to have found a way to come together. The song ended, and there was sweaty madness. Thousands of people pushed towards the streets leaving behind a wasteland littered with beer cans, potato chip bags, and food. 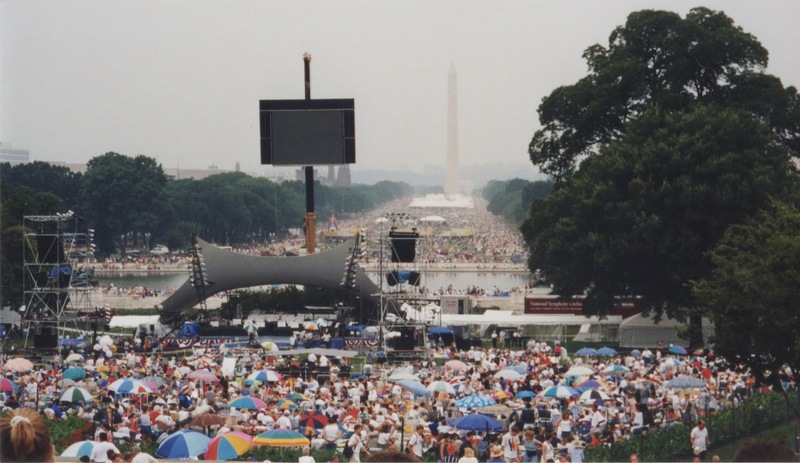 An estimated 450,000 people filled the Mall on this 222nd birthday of our country, and we had been right in the middle of the melting pot of patriotic Americans. This entry was posted in Uncategorized and tagged fourth of july, Independence Day, July 4th, July fourth, Patriotism, Tony Danza, washington DC, writers, writing by dfsalvador. Bookmark the permalink.